You want to begin digital SLR photography with a camera that offers a full range of state-of-the-art features — but you don’t want to do it with ordinary, uninspiring equipment. 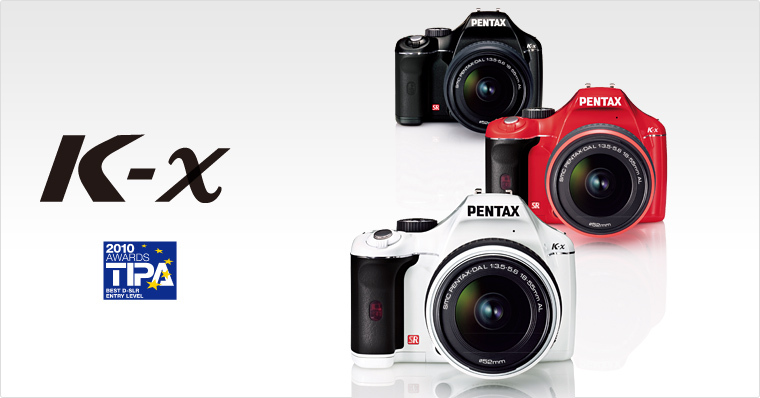 If that’s the case, the PENTAX K-x is your ideal choice! It not only offers an assortment of advanced functions and user-friendly features in a compact, lightweight body, but also lets you choose the body-and-grip color combination, with 100 variations to satisfy 100 different color preferences. Encased in a colorful, eye-catching camera body (and fitted with a matching lens), the K-x will be the perfect, personalized partner for your digital SLR photographic experience. Standard-color models (white, red and black) are marketed through regular sales channels. The color of an smc PETNAX-DA L 18-55mm F3.5-5.6AL zoom lens matches that of a camera body. 100 color combinations must be custom-ordered at your nearby retail outlet. The K-x is marketed only as a part of the K-x Lens Kit or K-x Double Zoom Kit. The DA L zoom lenses are marketed only as a part of the K-x Lens Kit or K-x Double Zoom Kit. All color combinations may not be available in certain countries/regions.